Pennsylvania and Maine have been locked in a sweets skirmish the past few weeks. The territory under siege is the famous whoopie pie. 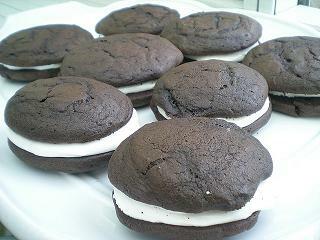 Folks in both states have laid claim to the whoopie as the official state dessert. If you can believe it, this topic has actually been debated in the Maine House of Representatives in recent weeks. Personally, if I were a native Pennsylvanian, I’d say let them have it. Whoopie pies have never been my favorite. You get about halfway through one and it’s sugar overload city. For the lowly whoopie is not the subtlest of desserts. Slab of spongey chocolate cake, dollop of sickly-sweet white creme, another slab. That’s it. Perhaps sensing the crudity of their confection, some innovators have tried variations on the classic black cake/white creme pairing. I once tried the peanut butter creme version. Still had to stop halfway through. 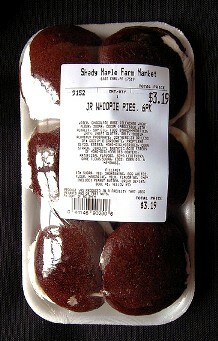 Whoopie pies are like radiation or minor-league baseball–to be consumed in small doses, if at all. Plus, it’s not like PA doesn’t have other desserts that might fit the bill as the state’s finest. And that’s not even considering the non-Amish/PA Dutch ones I’m less familiar with. I’m not sure what else Maine has though. Lobsterpops? (As it happens, there are 3 Amish settlements in Maine–hardly Lancaster County, but the only Amish in New England) In an act of compromise, yesterday Maine legislators approved calling the whoopie pie the official state “treat”, rather than “dessert”. Whatever. They apparently want to make their mark so badly they’re constructing a 500-lb whoopie pie, double the largest whoopie whopper Pennsylvania has ever erected. So all things considered maybe this is one that PA people just need to back off on. As for my home state of North Carolina, there’d be a lot to pick from for state dessert. 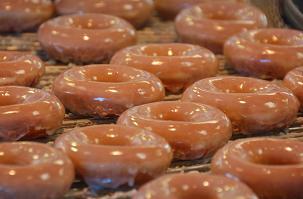 But in the end I think I’d nominate a simple classic–the Krispy Kreme doughnut. Why the Krispy Kreme? The company was founded in Winston-Salem in 1937, and they’re still headquartered there today, so that gives NC a pretty strong claim. I realize this is more a brand of an archetypal dessert–the doughnut–but the classic Krispy Kreme is an international icon. 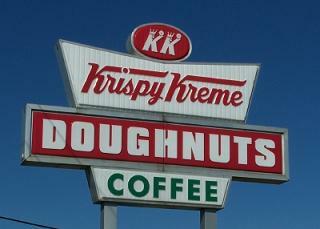 When you think “Krispy”, you think of the standard plain glazed–not like Dunkin’, with its cornucopia of constantly-changing flavors. The Krispy Kreme is simple like the whoopie pie, but distinguished by its subtlety and lightness. Plus, unlike the whoopie, they’re highly edible. They’ve got the perfect level of sweetness–just enough to complement a morning coffee, but not enough to whoop you into sugar catatonia. Served warm, there’s just not much that kompetes with the Krispy. Do you already have an official dessert? If not, what should it be? 4 responses to What’s your state dessert? I am originally from PA, from Philadelphia to be exact, and would like to comment on PA state dessert. I spent just over half my life in Philly and nobody that I am aware of – relatives and friends – has ever raved about whoopie pies. The first whoopie pie I’d ever seen was in Maine. For PA state dessert, I would like to suggest Philly Cheesecake, or perhaps cinnamon buns (a/k/a sticky buns) as a tribute to the many German immigrants who settled there. Shoofly pie would be another great choice in tribute to Amish settlers. Not every state can make that claim. Perhaps less well known, but equally delicious, would be Philadelphia butter cake – which is not the same as that found out in the St. Louis area. It is yeast-based, and apparently created by German immigrants as well. Many Philly bakeries sold it when I was growing up, and some still do. Any of those would be authentic PA dessert choices. Also, very famous was Philadelphia ice cream back in the day, but I would go with a baked good. PA people love their baked goods. I have to agree with Beth S. Though I am from Maryland we visited Lancaster County many times when I was growing up in the 1960’s. The closest thing to a whoopie pie that I recall between our two states was a Tastykake chocolate Kreamie … oh so good!!! My first thought for your official dessert is shoofly pie!! And yes, I’ll vote for that Philly Cheesecake! My husband and I lived in Rhode Island in 20-30 years ago. That is where I first tasted a whoopie pie. Butter cake??? Do u have the recipe that sounds so good like something I would try for Christmas. I have a great source cream pound cake recipe. So do u ever go for the Bordentown flea market really good market big buildi g of Amish foods from bakery to butchers. Worth the drive even open on Thanksgiving day! Right at exit 7 of the NJ like exit toward Ft Dix…About 2 or three miles down on right you will a large red building right after a service station Me red light. Great market HUGE good produce ethic foods of All ki!New.BUT my favorite are by far the fresh hot baked pretzels fresh out of oven which are HUGE will cover a dinner plate and dipped in butter great for breakfast. www.Bordentownfarmersmarket.com now BUTTER CAKE whish I had some! Anything with peaches. Most popular problem peach pie or cobblers..
Leave a reply to What’s your state dessert?